Though the PMP® exam aligned with PMBOK® Guide, 6th Ed on Mar 26, 2018, the CAPM® exam can still be taken for the 5th Edition until May 20, 2018, and many of our students are preparing for it. In order to accommodate those students, we challenged ourselves to make both the older and newer version of our content available simultaneously. We are pleased to announce that for the first time, we are simultaneously offering both PMBOK® Guide, 5th Ed and PMBOK® Guide, 6th Ed content on our site. If you are preparing for the CAPM® exam based on PMBOK® Guide, 5th Ed then write to us, and we’ll switch your account to the older version until May 20, 2018. If you would like to learn more about the changes in the PMBOK® Guide, 6th Ed, please refer to this post: What’s New in PMBOK Guide, 6th Edition. About 30% of our content has been revised in order to align with the PMBOK® Guide, 6th Ed. Let’s review the major changes to our content and product features in detail. One of the biggest change in the PMBOK® Guide, 6th Ed is on the ITTO side. Not only has the number of ITTOs more than doubled in the 6th Edition, this edition has also significantly changed the way ITTOs are presented. The 5th Edition had 618 ITTOs, and they were listed in a flat structure. The 6th Edition has 1452 ITTOs, and majority of them are listed in a parent-child structure. 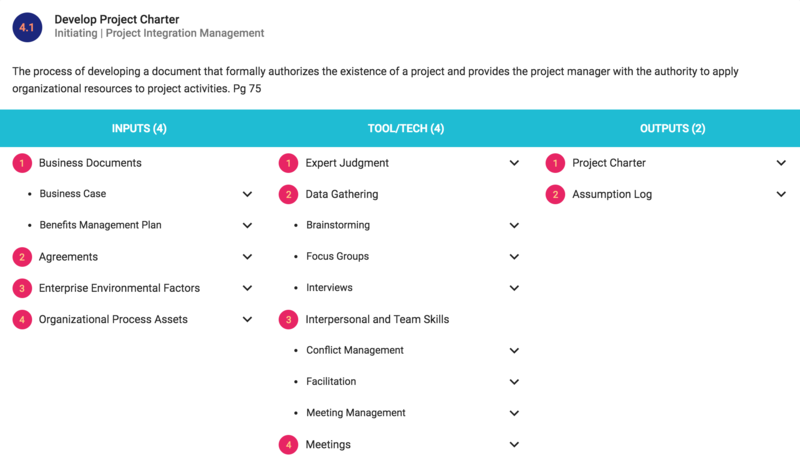 In other words, ITTOs are grouped by categories like Business Documents, Project Management Plan, Project Documents, Data Gathering, Data Analysis, Decision Making, Data Representation, Interpersonal and Team Skills, etc. Each of these categories has sub-ITTOs of its own. This presented a new challenge for us in representing the new structure on our ITTO Explorer tool without losing its usefulness, intuitiveness and design simplicity. We are glad that we managed to enhance it by making a few subtle changes and retaining most of the original design. Refer to the screenshot of the new structure. If you have used the Quiz module of our program, you would know that the Process, ITTO and Data Flow quizzes show the ITTO grids below the correct answer so that you can verify the answer without leaving the Quiz tab. However, if you want to deep-dive into a particular process or ITTO, you cannot simply click and open it. You have to manually navigate to the ITTO Explorer tab, search for the process or ITTO of interest, and open it. We have addressed this limitation in the new version such that when you click on a process or an ITTO on the Quiz tab, it will open it up on the ITTO Explorer tab in just one click. We hope that this enhancement would make the Quiz even more useful. We have updated the exam score report to align with PMI’s new 4-level rating scale. Read this blog post to learn more about new rating scale used by PMI: PMP Exam Result Report is changing in Aug 2017 [also applies to CAPM]. We have added about 200 new exam questions and 250 new flashcards to our database to reflect the changes in the PMBOK® Guide, 6th Ed. We have also added new categories of flashcards, such as Agile, Project Environment and Role of the Project Manager. We undertook a comprehensive grammar and spellings review for all the content to maintain the high quality standard that we strive for. We addressed a few bugs and optimized the code to improve performance and stability of our application.